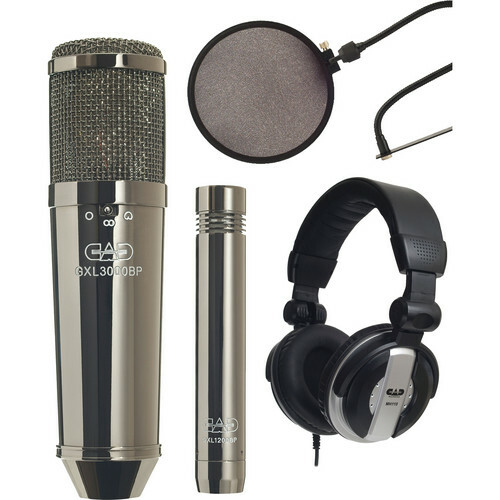 The GXL3000BPSP Studio Pack Bundle from CAD consists of the GXL3000BP Multi-Pattern Condenser Microphone, GXL1200BP Small Diaphragm Cardiod Condenser Microphone, the MH110 Studio Headphones, and an EPF15A Pop Filter. The pack also includes a shock mount and a mic clip. The GXL-3000BP Multi-Pattern Condenser Microphone features a custom black pearl finish, a large diaphragm and multiple polar patterns. The condenser microphone is designed for capturing vocals and general instruments in project and professional studio recording applications. The 1" gold vapor deposited diaphragm provides cardioid, omnidirectional and figure 8 polar patterns. The GXL1200BP Small Diaphragm Cardiod Condenser Microphone features a custom black pearl finish and a small diaphragm condenser element with a cardioid pattern The cardioid polar pattern is effective in minimizing noise, ambiance and feedback. The GXL-1200BP is intended for general instrument pick up, although proven highly effective for vocals. The high SPL handling enables loud audio signals to be reproduced without noise or distortion. The GLX-1200BP is housed in a slim, rugged enclosure ideal for spot capturing vocals and instruments such as guitar, strings, woodwinds, overheads, cymbals, and percussion. The MH110 Studio Headphones provide high-quality audio, suitable for studio monitoring, recording, and other applications. The headphones have 50mm neodymium drivers to deliver audio with an extended frequency response, clarity, and detail. Designed to remain comfortable during long listening sessions, the headphones have a padded, adjustable headband and thick leatherette ear cushions. The around-ear cushion design, combined with the closed-back ear cups, helps to block out unwanted ambient noise so you can focus on your music. The headphones also feature an easy-fold design for convenient storage. The EPF15A Pop Filter is designed to filter your voice before it reaches the microphone for maximum vocal performance. It consists of a 6" nylon mesh screen, a slim, flexible gooseneck, and a swivel mount. Box Dimensions (LxWxH) 15.4 x 8.8 x 5.7"